Manu Ginobili, NBA legend and all-around great human being, retired today after 16 seasons with the San Antonio Spurs. This moment was a long time coming, but still shocked fans and sparked an outpouring of love and memories about the Spurs’ most popular player. Yes, most popular. NBA fans outside the city might wonder how Manu earned that distinction over other Spurs greats like David Robinson or Tim Duncan. And it’s true that most Spurs fans would call Duncan the “greatest-ever Spur.” But if you asked a random Spurs fan who their favorite player was, the odds are high that they’d say “Manu!” without hesitation. Spurs fans love Duncan, but we adore Manu. It’s not just that he’s a Spanish-speaking player in a largely Latinx city, though that’s certainly part of it. He connects with so many Spurs fans through a shared culture, and has made fans all over the world thanks to his love of travel and multicultural way of life. But what Manu is perhaps most loved and famous for is his passionate, risk-taking style of play. He was just plain fun to watch — it was like witnessing magic. Manu pioneered a new way to compete in the NBA with his innovative Euro-step and thrilling pace, which few players have even come close to matching. When he announced his retirement today, I’m sure other fans were thinking the same thing as me: it just won’t be the same to watch a Spurs game without Manu. There was a similarly emotional response when Duncan retired two summers ago, not only because he was a respected and beloved player, but also because of the fear the Spurs would not be the same without him. It would’ve been easy for the team to unravel after Duncan’s retirement — if not for Manu. 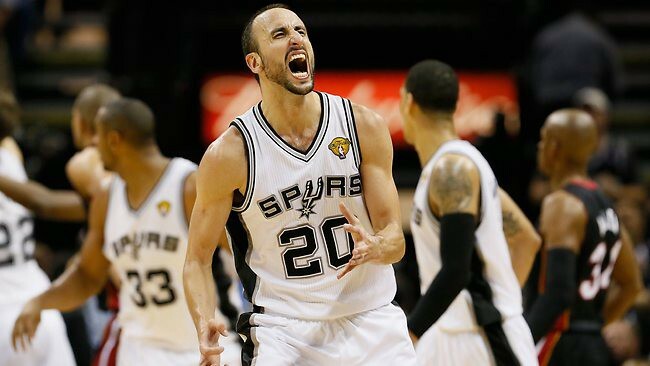 Ginobili held the team together through his dedication and his leadership. He was a flesh and blood testament to the idea of never giving up. Manu embodied resilience. Sure, he had the occasional bad game, but he always rallied, and fans always knew we could count on Manu to be there when it mattered most. When other players seemed overwhelmed by a tough opponent, Manu closed out the game with confidence and inspired his teammates to persevere. This is not to mention the valuable basketball IQ and mentorship he imparted to younger members of the team. The Spurs could not have weathered the first couple of Duncan-less seasons nearly as well without Manu. No one put their body on the line like Manu did. During his last few seasons, he earned the nickname “Grandpa Juice” because of his seemingly endless supply of energy that belied his age. He took risks on the court more suited to a player half his age — moves that would be difficult for even the youngest of players. Manu never accepted the concept of “slowing down” or playing it safe. He’d spent most of his tenure on the team playing off the bench, because it was best for the Spurs’ system, and he knew that he had to make every single play count. Being the sixth man never dulled his impact — he made some of the most important contributions despite his limited minutes. Tim Duncan was the body of the Spurs. He was the steady, stoic backbone that held the famous Spurs system together, day in and day out. He created a foundation of excellence that has carried the Spurs through many a playoffs run and transformed many an unproven player into a world-class talent. The renowned “Spurs culture” wouldn’t be what it is today without Timmy. But Manu was the beating heart of the team. And for that reason, the hearts of San Antonians — and Argentinians, and countless other far-flung fans — feel like they’re breaking today. The player that never failed to fire us up is moving on to the next stage in his life, and the Spurs will never be the same. Manu has said that he wants his legacy to be that of a good person and a good dad who raised his kids to be good people. His three boys can be proud of their dad for his accomplishments on and off the court, and will certainly grow to possess the same passion and determination that set Manu apart. He’s shown his sons, and all of us, what can happen when you do what you love and give it your all. And his competitive spirit will live on in Spurs culture — though no one will ever play quite as fearlessly and boldly as Manu. All I can say is #GraciasManu. For everything.